While planning event(s) that is spread across different countries, calculating time zone differences is very important task. You need to check on specific time zone difference of specific countries and mention time accordingly. 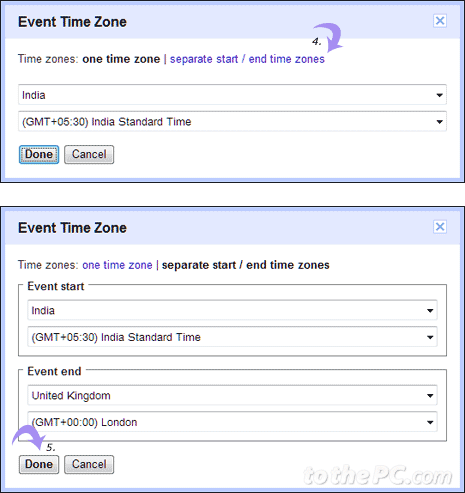 Now you can manage all this easily using ‘event time zones’ feature in Google Calendar. When your current time zone changes, Google Calendar will adjust event time zones automatically. 1. Login into your Google Calendar at google.com/calendar and click ‘Create Event’ button. 2. Then click ‘Time Zone’ link at top right. 3. In the ‘Event Time Zone’ pop-up, select the country name. Time zone for that country will display automatically. 4. You can customize it further by clicking ‘separate start / end time zones’ link. Here you can mention event start and end time in different time zones. I agree — this is even worse than nothing. I divide my time between two time zones. I want to be able to put in appointments AT LOCAL TIME, but this doesn’t do it. Before I tried, but even writing out the time in the title would get the event time recalculated. With this I have to figure out what the time is in one time zone, then wait for it to be recalculated when I go elsewhere? Useless. 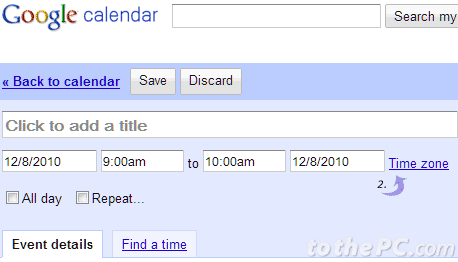 The new addition of Tme Zones to events in Google Calendar was a good idea, but this feature DOES NOT WORK. When you enter a time zone and all your event details, then click Save, the event time in your calendar does not appear at the time you selected. For example, when you enter a time zone one hour ahead of yours, your 9am event appears as 10am in your calendar. This is stupid! Simply put, if you want an event to start at 9am, is needs to appear in your calendar at 9am, and not be adjusted backwards or forwards according to the time zone you selected. Is that all that hard to figure out? THE EVENT TIME IS THE EVENT TIME AND IT DOES NOT CHANGE JUST BECAUSE THE TIME ZONE DOES. Guys, can’t you get this right – LEAVE THE EVENT TIMES ALONE. You don’t need to muck around with time zones or anything else. Allow the user to define the event start and end times and leave them exactly the way the user entered them REGARDLESS OF THE TIME ZONE. After having high hopes for this new feature, i am left as disappointed as I was at the beginning. Your programmers need to get out on the road and live in the real world – having your appointments changed every time you change a time zone leaves you not knowing what time your appointment is supposed to be. I can’t trust my Google calendar.